Working in homes that have suffered water and fire damage, calls for some serious mold removal, and a lot of tough cleaning on surfaces of all types. 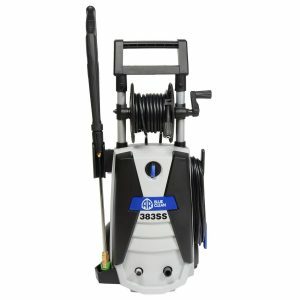 One of my favorite power tools for clean up and restoration that can be used inside and outside of the home, is a light or medium electric pressure washer, such as the AR Blue Clean ar383ss. This little machine is rugged and versatile, that’s why we are going to review it today. AR Blue Clean AR383SS What Is It And How Does It Work? The ar Blue Clean ar383ss, considered as a medium power washer, simply because it packs a whopping 1900 psi (pounds per square inch,) maximum crud lifting spray, that can be used to clean porous and smooth surfaces inside the home such as concrete, tile, marble, or granite. Outside of this workhorse can wash boats, decks, driveways, patio, siding, sidewalks, and vehicles. If your plans are for using this power tool inside of a home, I suggest that you use short bursts in concentrated areas such as floors near walls and on countertops, because it will produce 1.3 GPM’s (that’s Gallons per minute) that is a lot of water that you will have to extract separately, using a wet/dry vacuum like Rigid’s Workshop. Out of the box, there are a few components that you will need to assemble. Tools you will need are a Phillips screwdriver and Allen wrench. You will have to slide the gun holder on the side of the machine. The lance tray easily snaps into place and then you will just need to screw (provided by the manufacturer,) to the body. Be sure to follow the instructions for assembly. Save your instruction booklet in a file folder or cabinet for future reference. Your pressure washer will come with all the accessories that you will need to work with on most projects. But there is a slew of other products available such as a foam cannon which is popular for car detailers, the ar patio cleaner which is around 12-inch floor cleaner that is a must for most indoor cleaning of hard surfaces. This thing has an anti-splash guard and comes with an extension wand. One catch is that you will have to purchase a 22mm adapter, for the ar 383ss, and the ar 390ss. This attachment is great for close up work near walls. QR filters included with the pressure washer is great if you have known sediments in your water, this filter will catch the particles that will harm your machine. If you won’t drink it, then don’t give it to you power washer either. One reason why your Blue Clean pressure washer, may not turn on is due to the fact, that on the GFIC plug-in, you have to push the reset button before turning it on. If it still doesn’t start it would be a good idea to have a professional to check your plugs. Your Blue Clean, pressure washers run on 13AMPs. A basic appliance circuit in your home is 15AMPS. Using your ar 383ss pressure washer should be on a dedicated 15AMP circuit that doesn’t share with other household appliances. If in doubt call an electrician to help you out. Pressure Washer Tips Are The Colors Universal? From my research, I have found that the nozzles or tips for all power washers are universally color coded. However, if you ever lose a tip for your power washer it is probably best to purchase tips that are made for your pressure washer. If a generic tip that you purchased comes from home depot, and they do not fit snug in the quick connect socket don’t use it. 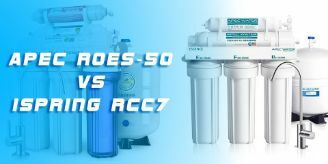 Which Nozzle To Use For AR Blue Clean 383SS Pressure Washer? 0-degree pressure washer nozzle (Red) This high-pressure nozzle tip is for tough jobs and. Sprays a laser stream at full force of 1900psi. Use this nozzle to get the most power in a concentrated area. Be careful because this tip will chunk wood, drill holes in the mortar, and take paint off surfaces. The low-pressure nozzle is for spraying soap (Black) Use this tip for applying detergent. How it works is the low-pressure tip has a large orifice which increases pressure in the hose and causes a back pressure allowing detergent to draw into the line. Use detergents that are specifically for pressure washers, No bleach, ammonia, or homemade cleaning solution. Doing so could be unsafe for the environment or your health and could damage your appliance. Pressure washer fan nozzle (Green) This sprayer tip will fan 25 degrees. It is used for washing siding, concrete floors, and brickwork. Rotary turbo spray nozzle: for pressure washers, is a great nozzle to use when you need the force of a 0-degree tip but fans out to 25 degrees. The turbo also rotates creating a funnel or cone shape. Great for cleaning driveways with grease spots, and ground in dirt or soot from concrete porches. You’ll get all four spray nozzles or tips when you purchase your own ar Blue Clean ar383ss. To see all the features, parts list, and accessories Click Here. I easily recommend this amazing machine! Immediate progress always makes you feel good and this pressure washer doesn’t disappoint. I just completed 2 large decks and patio and I couldn’t be more impressed with this electric washer! My husband was skeptical as he prefers gas, but even he couldn’t complain when he saw how easy and fast I was able to get the job done. So lightweight and efficient! Perfect washer for a quick job. I have a larger, gas-powered pressure washer but it is a hassle to get out and operate for smaller jobs. So… I purchased this one! Such a good quality machine and well put together too. I needed more stretch than it came with so I ordered the extension hose and it works great! Perfect item for a quick and easy job. The body of the ar383ss is made of sturdy plastic. This is really good if you have to haul around the pressure washer in the back of a truck or van. The wheels are also made of plastic but have a bearing on the wheel which makes these wheels easy to roll. Nozzle accessory storage is a handy feature to keep your nozzle tips organized and handy. quick connect nozzles allow you to transition from soap to washing really fast. 30’ of hose on storage reel, allows you to work at a further distance without having to move the pressure washer all the time. The oversized fittings make this super easy to connect the wand to the housing on the machine. The total stop trigger system is super nice to have especially when kids or birds are playing around while you wash.
GFCI Plug with quick cord release, fast and easy to plug in and get busy. Having a removable detergent tank on the unit makes filling the tank with soap and other cleaners almost spill free. In my book, this is a super benefit to other models in the ar Blue Clean ar383ss class. The hose reel is for storage only. When you use your ar383ss you will need to un-reel your hose all the way out. This makes for a tripping hazard when washing inside of a home and you have a small crew with you. Need to use lance (provided) in order to attach nozzles into it. I would have rather had a screw on quick connect fitting. This is why if you lose a tip you need to make sure a generic tip will work for this model. Or you will need to purchase one from the manufacturer. One year bumper to bumper guarantee warranty is only for the original purchaser. If you purchase this machine at a garage sale or from a private party, the warranty will not apply. However, these cons aren’t that noticeable or make this model any less supreme over its competitors. In my opinion, it is one of the best electric pressure washers on the market today. Test Drive The AR Blue Clean AR383SS, For Yourself By Clicking Here Now. Product Description: The cons aren’t that noticeable or make this model any less supreme over its competitors. In my opinion, it is one of the best electric pressure washers on the market today.